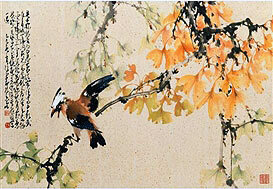 Ginkgo tree and kingfisher, Chinese painting by Zhao Shaoang. Ink and colour on paper, 1965. More info and enlargement here. Panorama photo of a Ginkgo tree in Parque Ecológico Xochitla, located three km outside the city of Tepotzotlán, in the northwest area of Mexico city. The park of 70 hectares has about 7,000 species of trees and other plants . It is considered one of the most important projects to nature conservation at the Central Mexico’s Valley. Panorama photo by Manuel Vega Velazquez. Prehistoric life: Therizinosaurs are a strange offshoot of the theropod dinosaurs. 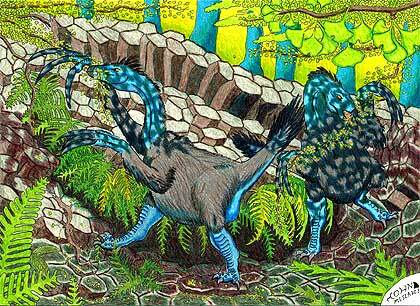 Although most Mesozoic theropods were carnivorous, Therizinosaurs were herbivores. Their large, sickle-shaped claws (which give the group its name: Greek therizo meaning “to cut” or “to reap” and sauros meaning “lizard”) were probably used to pull down tree branches much like the claws of extinct giant ground sloths. Illustration (and large format of this illustration) : John Meszaros. Ginkgo Forest and Oolong tea plantation. Dalunshan (Dalun mountain), Lugu Township, Nantou County, Taiwan. 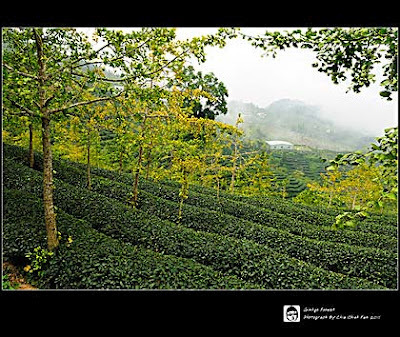 Because the roots of tea trees are rather short, the planting did not meet the Water & Soil Conservation Law. People and the government encouraged afforestation, planted the Ginkgo trees, and now the area of Ginkgo trees reaches over 80 hectares. It has become the largest Gingko forest area in Southeast Asia. Photo by fanedison on Flickr.com.